PGA Tour — Padraig Harrington missed the cut as Bubba Watson shot a 67 to lead the Travelers Championship by two shots from Brian Harman, Brian Stuard and Carl Pettersson on 11 under. 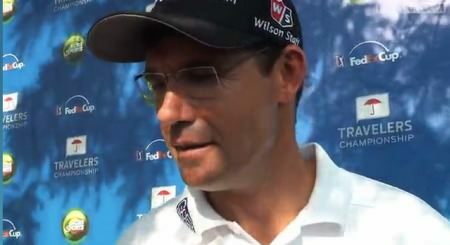 Watson has taken just 53 putts through two rounds but Harrington had an estimated 32 putts as well as a couple of three putts in a five over 75 at TPC River Highlands to miss the cut by three strokes on one over par. Ranked 92nd in the world, Harrington has now missed eight cuts from 15 strokesplay starts and four of his last seven. Since he won the Honda Classic on March 1 for his first PGA Tour win since 2008, his best finish in 10 starts in a share of 42nd in The Players. His next scheduled start is the Scottish Open in a fortnight. Web.com Tour — Seamus Power fired a level par 70 to fall two stokes bhind clubhouse leader Dawie vander Walt in the Air Capital Classic presented by Aetna in Kansas. The West Waterford man led after an opening 63 but he had three birdies and three bogeys on Friday to remain on seven under as South African vander Walt added a 67 to his openin 64 to lead by a shot on nine under from Argentina’s Miguel A. Carballo (65) with American Andy Winings also eight under through 14 holes when he play was suspended. Power was tied for fourth place with Korea’s D.H. Lee (69), Scott Gutschewski (66), Brett Stegmaier (66) and American Matt Mabrey (67) on seven under. Web.com Tour — Seamus Power finished tied 19th as American Rob Oppenheim in the Air Capital Classic presented by AETNA in Kansas. Web.com Tour — Nothing but birdies will do on the second tier US circuit and first round leader Seamus Power finds himself six shots behind American Andy Winings heading into today's final round of the Air Capital Classic presented by Aetna in Kansas. Harrington trusts his belly: "I'm starting to get comfortable"
A happy Pádraig Harrngton after his second round.Trust is a must for Padraig Harrington if he’s to add to his major haul. And it certainly looks and sounds as if the Dubliner has found some belief in the belly putter he put in the bag last month when he holed more than 100 feet of birdie putts for the second day running to lie just two strokes behind leader Bubba Watson in the Travelers Championship in Connecticut.